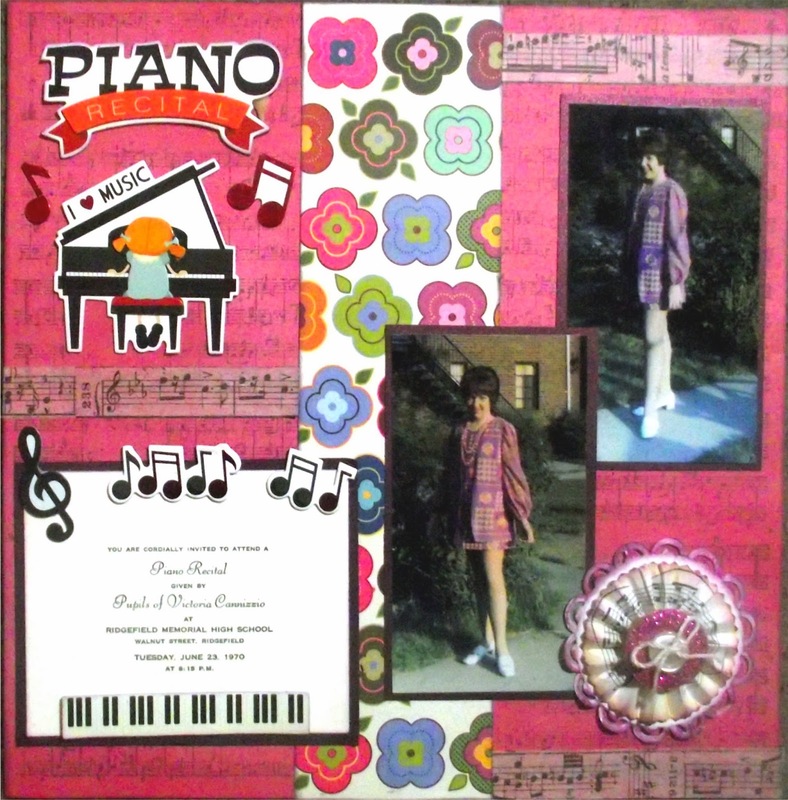 I finally put together two layouts from my Piano Recital in 1970! You can really see the era in the flower power dress I am wearing. Mom insisted on going to the beauty shop and I came out with a beehive hair-do (not quite to my liking). I am using the actual invitation and the program from the recital. On the inside of the program it also included our scores from the New Jersey Federation of Music testing and the selections we played at the recital. I copied those onto cream colored cardstock to resemble the program. I am entering these layouts in 4 Crafty Chicks challenge #4CC183 Music, Red Carpet Studios challenge RCS#64 the Academy Awards and Craft Hoarders Anonymous Challenge Blog #3 Vintage or Retro. I hope you enjoyed this blast from my past! Thanks for stopping by. All comments greatly appreciated. These layouts are amazing. Thanks for sharing at Craft Hoarders Anonymous! How delightfully retro! The colors, the designs, the fonts all support the retro vibe. Well done! Thanks for playing along in the Craft Hoarders Anonymous Challenge #3! I love them! You did a wonderful job capturing the feel of a recital. Well done! Very retro! Love the double page lo with not just pics but also the program. Thanks for sharing with us at Craft Hoarders Anon. Great layouts! Love the embillishments you have used Thanks for sharing with us at 4 Crafty Chicks, I hope you will join us again soon. How fun is this! I bet it brought back some great memories when you were creating the layout! Thanks for joining us at Red Carpet Studio this week and hope to see you again. Wow, can't believe you had all this memorability! Great layout. Thanks for joining us at Craft Hoarders Anonymous Challenge Blog. Just loved that fashion!! 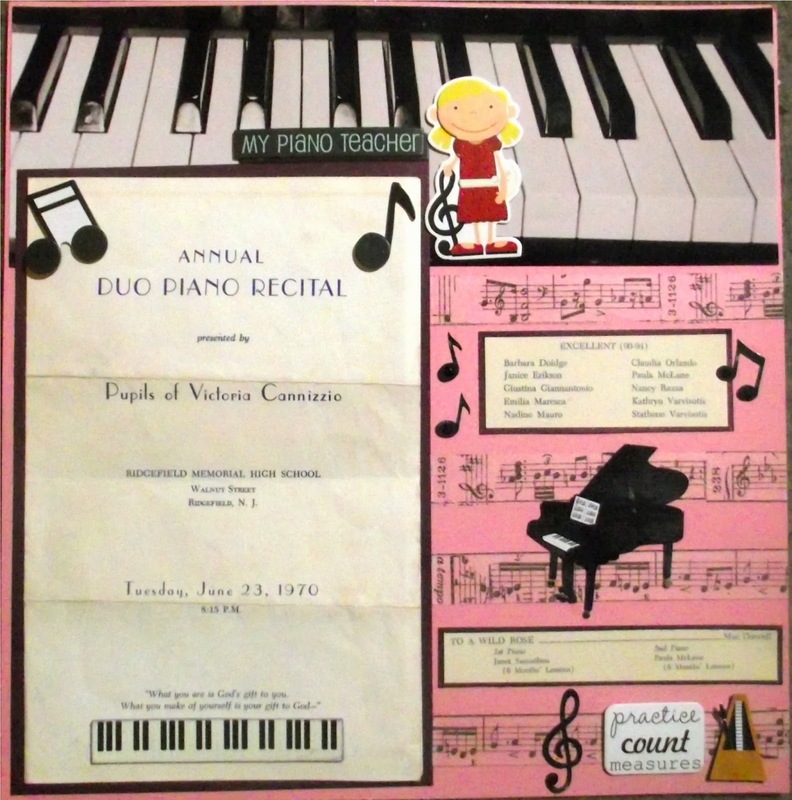 What a great page with your retro photos & recital brochure! This is so great! Very Retro! I love the hair and the dress! You used great embellishments for this layout! I makes me remember 1st grade in 1971...I had this dress and black go-go boots! hee hee Thanks for playing along with us at Craft Hoarders Anonymous! That's really cool! I love the original pieces of this! great retro page!!! Thanks so much for sharing with us at Craft Hoarders!! This is so retro and I love it! I always love seeing what the styles were like from past decades. Love the outfit and the hairdo. I like that you included the actual program. It is a great way to preserve a memory. Thanks for playing along with us at CHACB! Fabulous Retro layouts, love them. Thanks for joining us at Craft Hoarders Anonymous Challenge Blog! Groovy layout!! Love that dress and all of the fun elements you've incorporated in to your layout. . the mementos, the rosette. . .sweet! Thanks for joining us and sharing your style at Craft Hoarders Anonymous! Great pages. Thanks for playing at RCS. Wonderful retro layout! Thanks for playing along with the Craft Hoarders! This is a great heritage layout! Being a child of the 70's myself, loved having the flashback looking at your layout! Thanks for playing along at RCS!